Partly cloudy skies early will give way to cloudy skies late. Low 42F. NW winds shifting to ENE at 10 to 15 mph.. Partly cloudy skies early will give way to cloudy skies late. Low 42F. NW winds shifting to ENE at 10 to 15 mph. 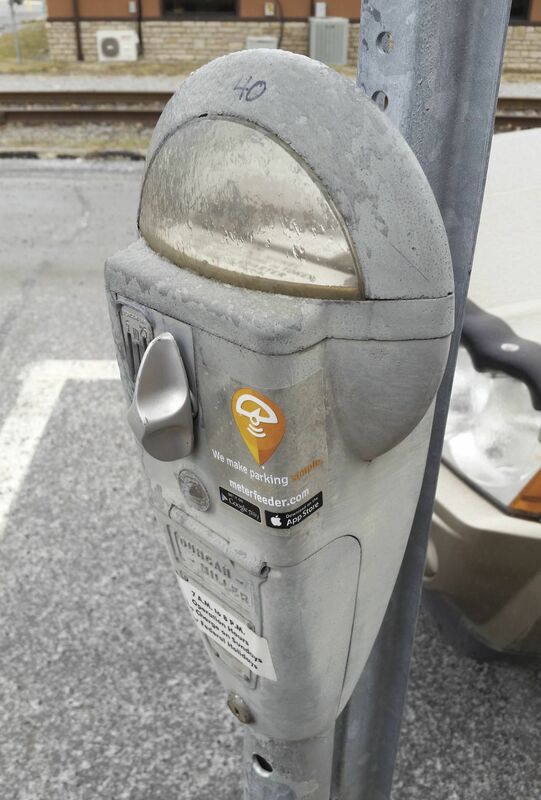 A parking meter on Erie Avenue in St. Marys features a sticker promoting the Meter Feeder App, which the city is integrating as an option for parking payment. Clockwise, from right, the system used by police and users for the Meter Feeder App being introduced for metered parking payment in St. Marys, and left, both the parking ticket slips the system produces and a traditional parking ticket. St. MARYS — If you’re looking for an easier way to avoid parking tickets in the city, there’s an app for that. Keen-eyed commuters may have noticed stickers on St. Marys’ approximately 300 parking meters introducing the Meter Feeder App to the city. “Our hope is that people will see it, see that it’s out there, and start using it,” police Chief Tom Nicklas said. The app, which can also be used at the city parking garage, aims to make paying for parking easier. By downloading the app to a mobile device, drivers can register their vehicle information and a payment method and pay for parking directly from the program. The app tracks remaining time and allows users to add more without running to a meter. Unlike paying cash for parking, Meter Feeder uses license plate information so if a driver moves, they don’t lose the time they’ve already paid for. The program requires a two hour minimum parking period and charges a 30 cents per day fee for usage. Cash can still be used at city parking meters. “Our goal was not to increase costs due to the convenience fee. It was to increase convenience,” Nicklas said. “We’re making it easier to acquiesce to the parking regulations,” Hannah Brock, city public relations officer, said. User can also use the app for any city covered by the system, including many in the Pittsburgh area. The move will also increase efficiency for parking enforcement officers, Nicklas said. He explained the entire process of entering ticket information can be done on-site from the field, rather than having to be entered into the department’s system at the police station. “It can all be done right there,” Nicklas noted. Drivers can also pay tickets directly from the app if desired. If someone loses a ticket, the app can help with that as well. “If someone does lose their ticket, we just bring up their license plate,” Nicklas said. He noted other officers will also be able to use the system for enforcement of things like areas where parking is restricted during certain hours and illegally parking in front of a fire hydrant. “It’s all very straightforward,” Nicklas said. The app is available through Apple’s App Store or Google Play. Cloudy with occasional showers for the afternoon. High 62F. Winds light and variable. Chance of rain 60%.